Nominations for the 2019 Howard Harris Lifetime Peacemaker Award will open in late spring. The award will be presented at International Day of Peace on Saturday, September 21, 2019. Lifetime advocate for peace, conscientious objector in World War II, and associate professor of anthropology at Western Washington University from 1966-1992. Howard and his wife Rosemary Harris founded Bellingham’s peace vigil. His legacy lives on among those who follow in his footsteps to advocate for nonviolence, object to war, and teach peace. Longtime peace and labor activists. Al was once a member of the Veterans for Peace National Board, and was a founding member of Bellingham Friends of Cuba. He was also a member of the Methodist Federation for Social Action, Veterans for Peace, and First Congregational UCC. Dale lives on by his wife Dotty, who actively participates in promoting peace within the Whatcom community. After a 25-year career as a U.S. diplomat, Nick retired to follow his passion for encouraging peace. A founding staff member for the Nonviolent Peaceforce, advocating for the reduction of militarism and armaments in the Asia-Pacific region. Nick and his wife are members of the Earth Ministry, and contribute to local environmental initiatives. Nick also writes for a variety of publications on foreign affairs, nonviolence, and other social justice issues. A longtime member of the peace and justice and environmental advocacy communities, Doris has set an example of dedication and integrity toward peaceful living. The guided focus of her life was to live in peaceful coexistence with all of Earth’s creatures, to seek justice and peace in the community, and to advocate for peace among people everywhere. Bill, a Vietnam War veteran and an advocate to discredit U.S. militarism was involved in the movement to stop U.S. intervention in El Salvador from 1981 to 1992. Bill has been a member of Veterans for Peace in Bellingham since the chapter formed in 2002 and volunteers with WPJC’s Alternatives to Military Service Program. James, a Vietnam War veteran whose life was changed by military experience. James is an advocate for women’s equality, the environment, and promoting the cause of peace. He continues to do veteran outreach in the community, share his stories, and help where needed. A nurse and activist, Margie is best known in Bellingham for her protest against the Iraq war and the disturbance she felt for the Iraqi civilians that have lost their lives. She has a long history of promoting peace and anti-war advocacy as she first found herself participating in a voter registration drive in Meridian, Mississippi, in 1965. Later, protesting the Gulf-war and decade-long sanctions against the Iraq war. Avid human rights activists Peter and Mary have been a strong part of the Bellingham community with their support and contributions. They have dedicated themselves to promoting peaceful living and nonviolence through their encouragement of education and community outreach. Senior instructor at Western Washington University, Shirley has been involved in human rights activism for most of her life. She is one of the co-founders of the Whatcom Human Rights Task Force, Central American Refugee Assistance (CARA), and Bellingham-El Salvador Sister City Organization. With CARA, Shirley was deeply involved in the underground railroad (Sanctuary Movement) that assisted Central American refugees into Canada in the 80's and 90's due to U.S.-sponsored wars in Central America. Since traveling to Palestine, she has also been a strong advocate for Palestinian human rights. With a lifelong dedication to nonviolence, equality, peace and justice, Ellen practices and teaches transformative nonviolent direct action, as she learned through working with Daniel Berrigan. Despite the repercussions of her courage to question congressional leaders on decisions that promote war, she continues her legacy of promoting peace. Ellen is part of the local organization Fellowship for Reconciliation of Western Washington that encourages nonviolence and seeks to replace racism and economic injustice with equality and peace. Longtime co-director of the Whatcom Human Rights Task Force, Barbara has advocated for education and outreach programs for awareness of issues in the Middle East. She is the co-founder of Whatcom Dispute Resolution Center and an educator around nonviolent communication. In 2002, Jamie opened the Whatcom Peace & Justice Center through her hard work and determination. 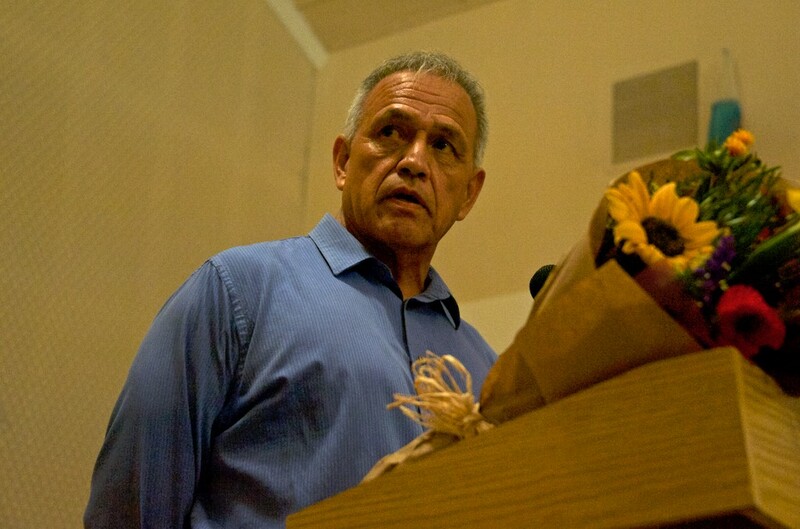 Jamie has a long history of promoting nonviolence, alternatives to joining the military, human rights issues, and was co-leader of the Central America Peace Campaign in Washington State. Jamie is board president for the Bellingham Food Bank and continues to promote peace and justice. Darrell is a tribal member of the Lummi Nation; a producer, writer, founder of the Lummi Youth Academy; and a father and grandfather. He hosted the Dalai Lama’s visit in Seattle, is a Seeds of Compassion Committee Member, and served on the Lummi Indian Business Council for 15 years. As a storyteller, his works include "What About Those Promises?" about the Lummi way of life and the broken promises of the Treaty of Point Elliott signed in 1855. Rosalinda is a widely recognized farmworker justice leader. She works to amplify the voices of farmworkers in national debates on immigration issues, labor rights and trade agreements. She also works to strengthen cross-border alliances to build a broader base of support for immigration reform and agricultural policies that ensure equitable, healthy and sustainable communities for farmworkers and immigrant families. Beth is a lifelong activist and educator who has dedicated herself to working for understanding and social action around tribal sovereignty and treaty rights. While living in Minnesota, Beth was deeply involved with Unitarian Universalist solidarity work in the Dakotas, including marching and camping in the Black Hills during the American Indian Movement occupation at Wounded Knee. She has played a significant supporting role in many tribal-led efforts in Bellingham. She took a leadership role in the Unitarian Universalist Association's repudiating the Doctrine of Discovery.